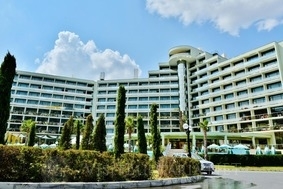 Marvel Hotel in Sunny Beach Resort in Bulgaria. Online bookings. Great prices. Location: Marvel Hotel is situated in the north part of Sunny Beach Resort, in the close proximity of the beach and the picturesque sea path. The new four- star hotel offers unbelievable view to the sea as well as big variety of services and facilities. Marvel hotel is only 35 km away from Burgas airport and 100 km away from Varna, near to the bus stops to the Old Nessebar, Sveti Vlas and Elenite. Accommodation: Marvel Hotel offers nice double rooms, studios and apartments. Each room has bathroom with shower and bath-tub, hair-dryer, balcony, direct telephone line, air-coditioner, mini bar and satellite TV. Facilities: Impressive swimming pool with children's zone, Jacuzzi, medical center, massage, two pool- bars, lobby- bar, hairdresser's, souvenir shop, non- stop supermarket, salon with electronic games, exchange bureau, individual safes at the reception. The indoor swimming complex offers a sauna, Jacuzzi, solarium, gym, and massage. Marvel Hotel is a pet friendly hotel. Meeting Facilities: The conference hall has 120 seats and it is equipped with all necessary techniques and apparatuses for the conduction of business meetings, conferences and seminars. Wine & Dine: The large restaurant offers buffet breakfast. There is also a-la-cart restaurant, offering comfortable terrace with sea view and serving varied meals from the European cuisine.